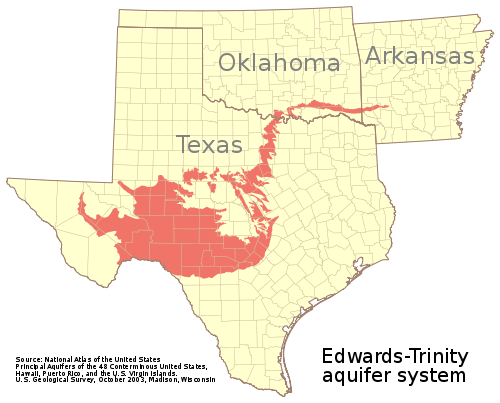 On March 11th, 2011 when the devastating 9.0 earthquake rumbled off the coast of Japan the effects were recorded over 10,000 kilometers (6,000 miles) away in an aquifer deep under the US state of Texas. The Edwards Aquifer is a huge karst aquifer, each year it discharges about 1.3 trillion litres (351 billion US gallons) of water, enough to fill half a million Olympic sized swimming pools. More importantly it provides drinking water for about two million people and provides a home to a number of unique and endangered species. To monitor the aquifer water level, a number of observation wells are in operation which are managed by the Edwards Aquifer Authority. One such well, J-17 which is located at Fort Sam Houston in San Antonio, Texas, has been monitored continuously since 1934. On March 11th, approximately 15 minutes after the earthquake struck Japan, the water levels in J-17 observation well started to fluctuate 0.3 meters (1 foot). The fluctuation continued and tapered off over a period of two hours. It is not uncommon for Aquifers to detect earthquakes. In fact the recent earthquakes that occurred in Haiti and Chile in 2010 were both recorded at J-17. Lots of excellent reading here, thanks! I was checking on yahoo when I found your submit, I’m going to add your feed to Google Reader, I look forward to much more from you.